Image Size: 13" X 9.75"
Image Size: 25" X 18.75"
Paper Size: 29" X 23"
On September 7, 1956, USAF Captain Iven C. Kincheloe flew the exotic Bell X-2 research craft to a new world altitude record of 126,000 feet - the first time a manned airplane had ever flown outside the earth's atmosphere. Considered as pioneering in 1956 as the moon landing was in 1969, this flight earned Capt. Kincheloe the well-deserved nickname of "First of the Spacemen." 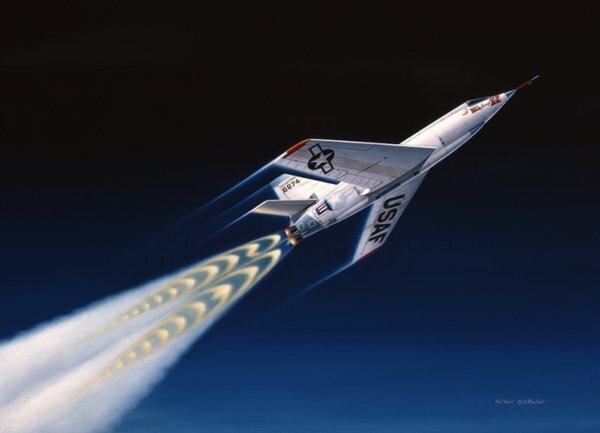 Machat's original painting contains actual granules of white paint obtained from the Bell X-2, which was also the first airplane to fly at Mach 3, or 2,100 mph.